Happy Friday! 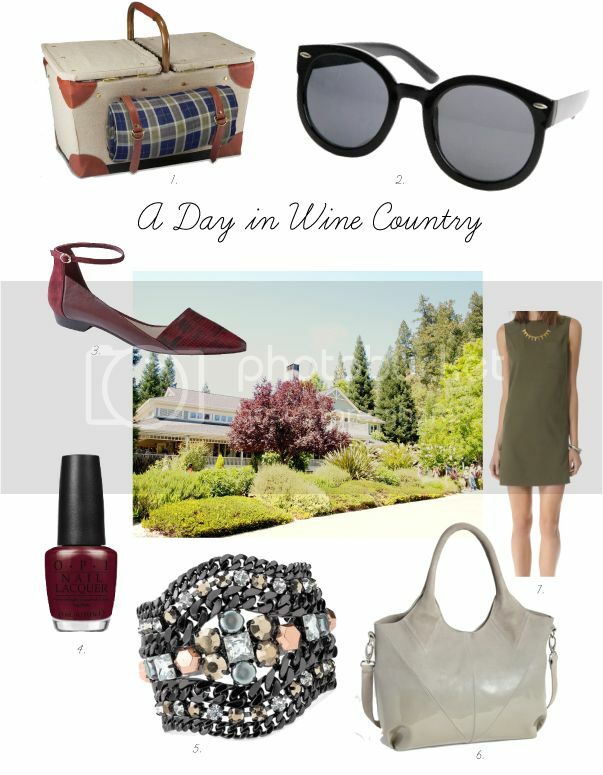 A day in Wine Country? Yes, please! I am beyond excited, after a crazy (but fun) week of hosting 2-BBQ's, a dinner party which included Shaun's CEO, and a company happy hour with 40+ people, to head north with the girls! Every year Jessica (sister) and Amme (BFF) spend a glorious day of wine tasting, a relaxing lunch, shopping and then out to dinner...no kids, no husbands! Both ladies have three kids each so we have been counting down the days through our on going three way text. On the agenda this year: French Blue for lunch, as always Duckhorn for tasting (pictured above) and Thomas Keller's ad hoc for dinner. Perfection! Inspiration board: Usually thinking of a day in Napa Valley, I gravitate towards an easy summer dress, floral perhaps, and sandals. But today I decided to let the colors of Napa inspire me rather than lifestyle...wine, greens, soft grays and blues. I came up with a very modern clean look with a killer statement bracelet, but still has an ease to it which would work in Napa. Enjoy and have the most wonderful weekend!